Basket pattern of your choice - I used the Basket Fantastic article by Austen Gilliland from the April 2013 issue of Canadian Living magazine but there are lots of great patterns on Ravelry if you search for "basket" and refine with "felting"
Using a bulky yarn or heavier yarns held double makes for very quick knitting! Check your stash to see what kind of scraps and leftovers would be good candidates for this project and get creative! Not having enough green yarn to make the basket forced me to see what else I had that would work. I opted for a simple 3 row stripe to integrate the second colour. Tip: If you decide to use scraps from your stash of different colours, you may want to make sure they're the same weight, as well as from the same manufacturer. If not, the yarns may felt at various speeds. Or, if you're not fussy you can embrace the creative difference in the results! Place the knitted piece in a wash basin with a bit of no-rinse wool wash like Soak and pour in enough boiling water to cover the knitting. 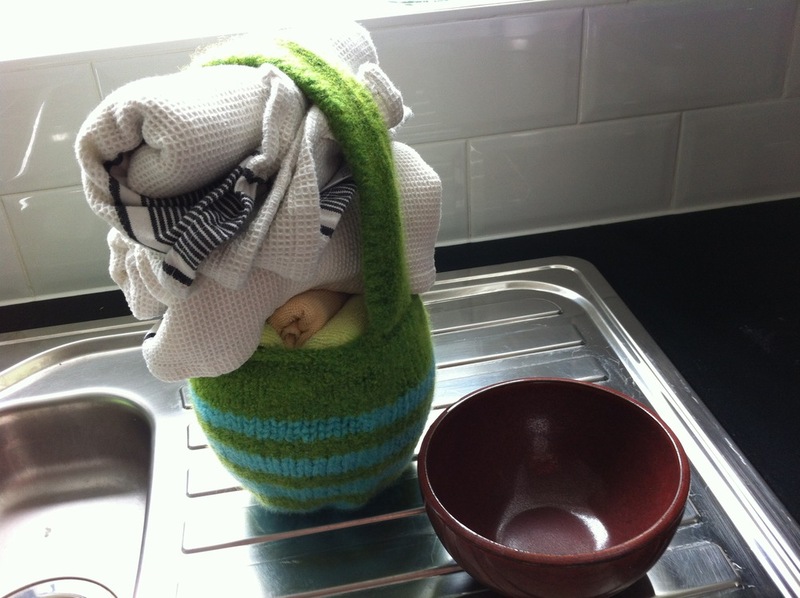 This will get the knitting clean at the same time that you're starting the felting process! This is where I veered from the pattern's instructions entirely and opted to go with the process that I've been using for the two felted purses that I've made. Your own method for felting may vary so feel free to use what works for you. Let the knitting soak for about 10 minutes in the boiling water and then while wearing the rubber gloves, lift out the knitting and gently squeeze out as much water as you can without wringing. 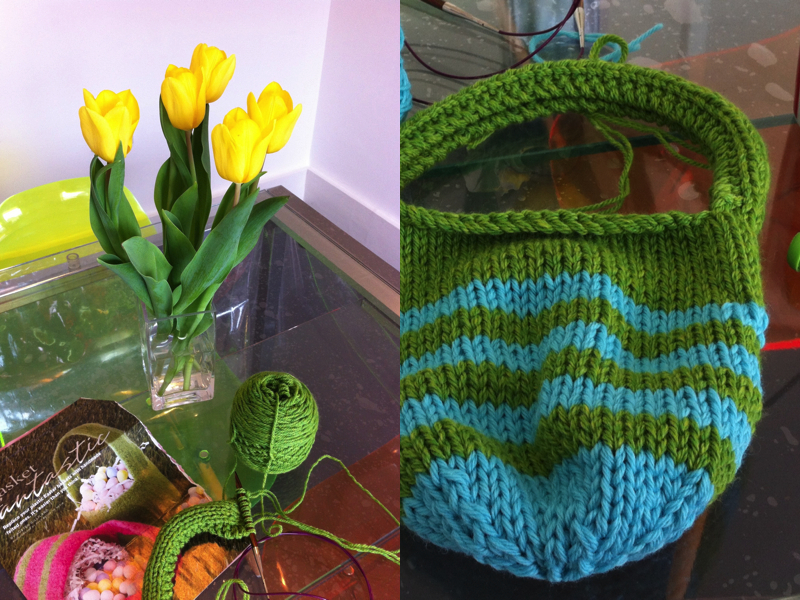 Place the knitting in a zippered pillowcase or pillow cover and toss the whole thing in the dryer on high heat. Dryer balls, tennis balls or other items in the dryer with the pillowcase will also help with the agitation process. Set a timer starting at about 30 minutes and check the progress of the felting semi-regularly. Felting times will vary, but check often for progress. Once the project starts to felt, it will happen fairly quickly. Freshly felted and out of the dryer! The really fun thing about felted wool is that when it's still wet it has a gorgeous sculptural quality to it. It also means that the fabric is quite forgiving and when it's still wet you can take the lumpy mess it is when it comes out of the dryer and shape it into what it's meant to be! Use a round bowl in the bottom of the basket to help it retain shape while drying. You may also want to add extra stuffing to help with shaping, and to keep the handle upright. Here I've opted to use tea towels. And that's it! A quick project that can be done in a day or two, and really easy to get creative with and design your own. You can even use it as an opportunity to try out different techniques like textured stitches or colourwork. Knit a hat that's too big? Try felting it into a bowl instead - the possibilities are endless. Enjoy! Oh, and if you do decide to try your own hand at felting, please send me pics of your results!